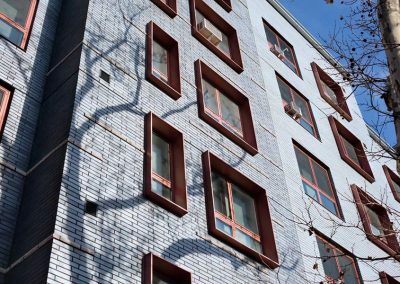 This seven-story apartment complex is located in the Williamsburg neighborhood of Brooklyn, New York. The 45,000-sq.-ft. building has 46 units, all of which are earmarked for low-income residents. 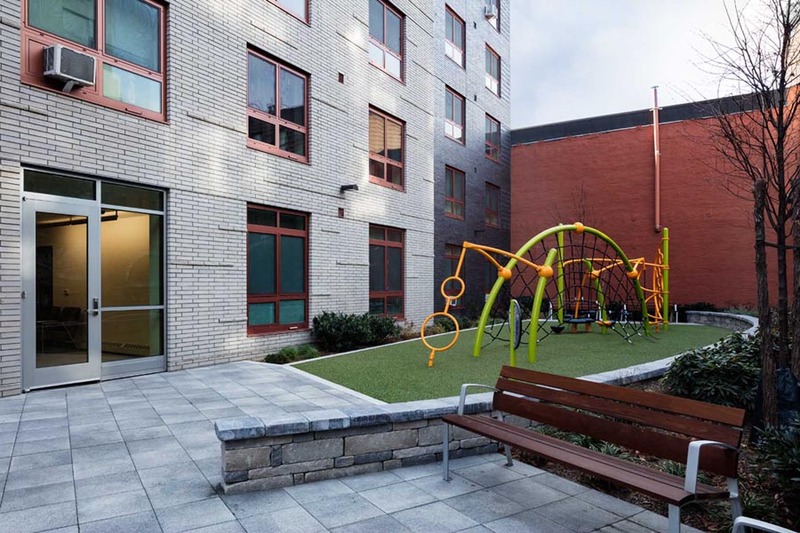 As a publicly-funded project, it needed to meet the strict energy-efficiency guidelines established by New York City. Also, the apartments are located just a few hundred feet from the Brooklyn-Queens Expressway, a major six-lane thoroughfare, so noise absorption was a major design consideration. 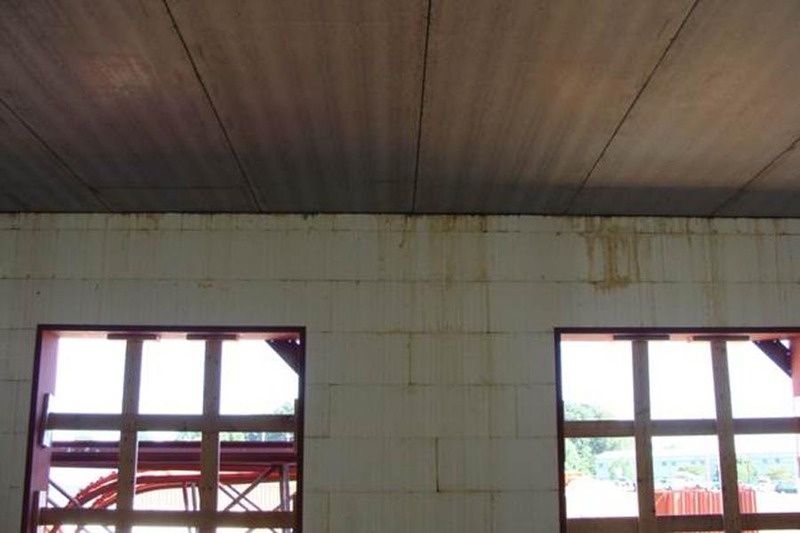 These concerns, along with a tight construction schedule, made ICFs an obvious design choice. Mark Ginsberg, a principal at Curtis and Ginsberg Architects, comments that particular consideration went into finding ways of dampening the sound of the traffic on the elevated arterial highway, and the combination of a heavy masonry and concrete structure with high performance windows effectively blocks this noise. 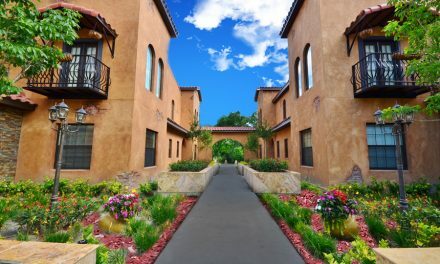 Designers also faced the challenge of getting a project of this magnitude to blend into and complement the existing neighborhood comprised of two- and three-story row apartments. 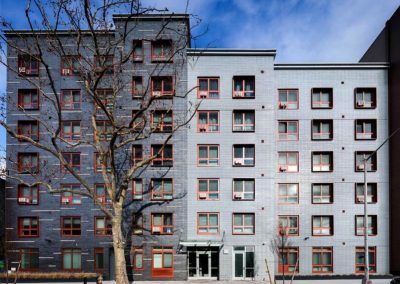 One of the ways the design team achieved this was by using two shades of grey brick in the façade and adding several “bump-out” corners to break up the building’s overall size. The floors are pre-cast concrete, popular in this type of midrise construction. 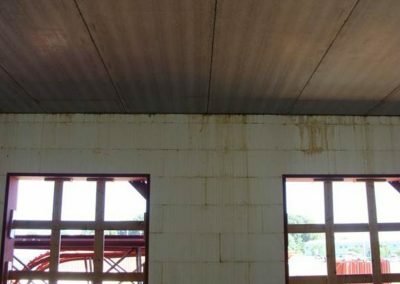 All exterior walls are ICF, as are most of the interior walls, which helps absorb sound and support the heavy floor planks. 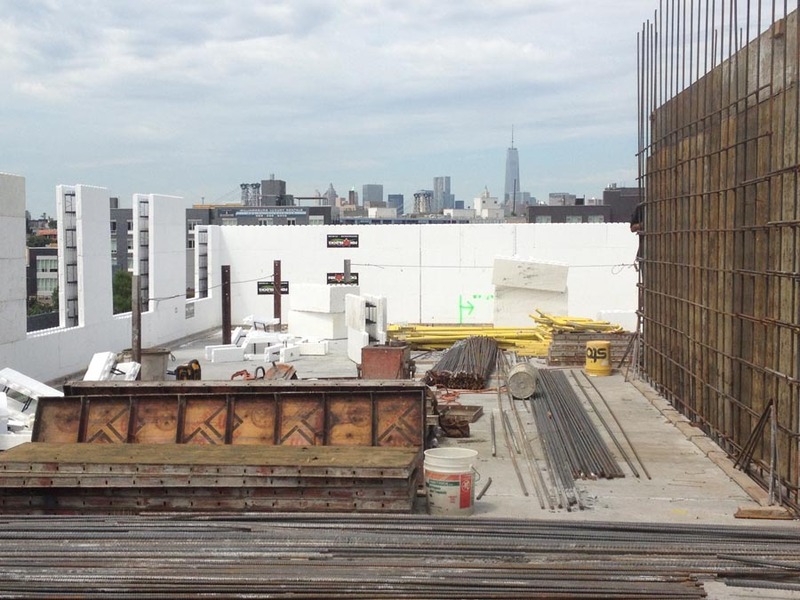 Dig and Pour, an experienced ICF contractor in the area, was chosen to install the 26,000 sq. ft. of forms. 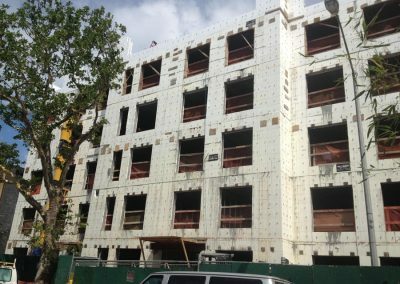 Fred De Martino, the project manager, says it’s the fifteenth ICF building the company has built in the six- to eight-story range. Construction had a few quirks. 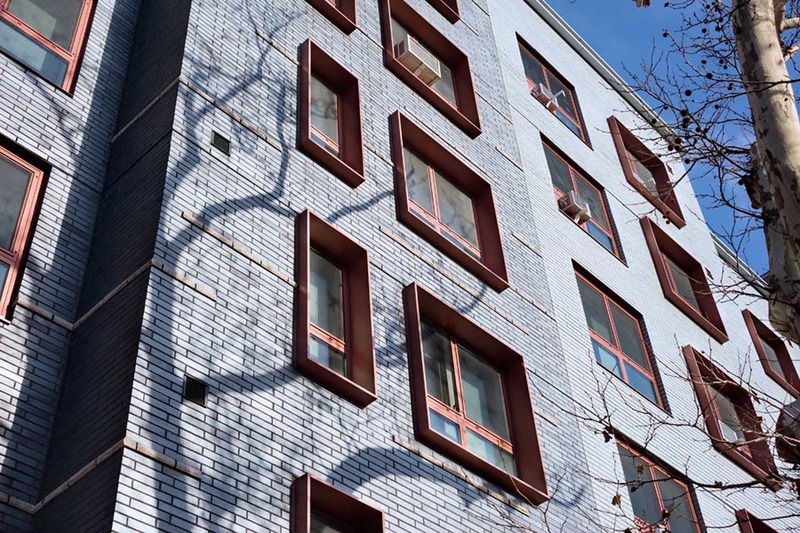 The building code requires that the brick façade be mechanically tied to the concrete core of the wall with cast in ties. The ICF contractor was responsible for installing these. 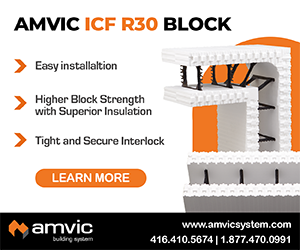 Because of the height of the building, the contractor installed the brick ties in the forms prior to setting the ICF into place. Additionally, the brick façade had steel angle shelves over each openings that had to be mechanically attached to the concrete. Dig and Pour did this by removing the EPS foam in several places near the bottom of each lintel, which allowed the concrete to come to the face of the form and encapsulate the angle steel attachment points. In this case, the forms were sold direct from Fox Blocks, and delivered from their nearby plant in Nazareth, Pennsylvania. 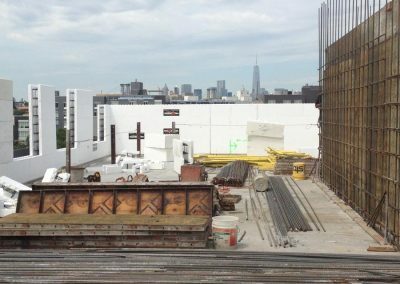 In total, the ICF install took about five months, with the entire project wrapped up in about 18 months. 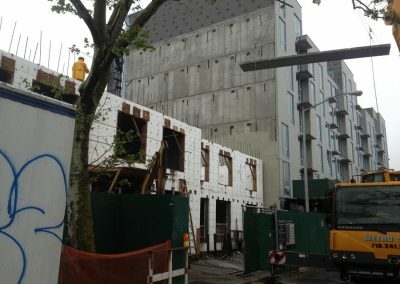 Blower door tests confirm that the building is 50% tighter than targets, and the building meets New York State’s Department of Housing and Community Renewal’s green design criteria. 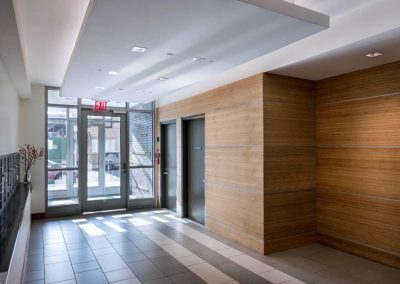 Finishes in the public areas such as the lobby are simple and elegant, employing high quality wood paneling and stone tile around the elevator. 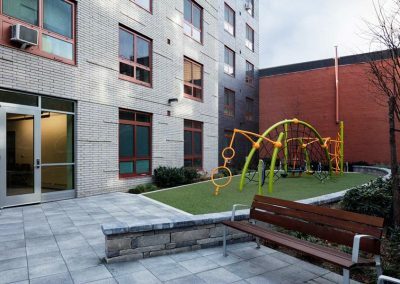 Amenities include a community room and laundry room that open onto a landscaped rear yard with play space for children, a sitting area and bike storage. 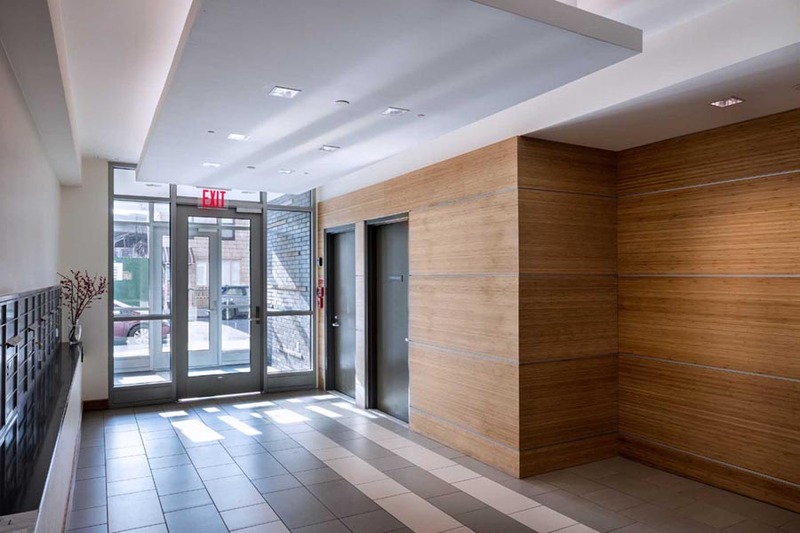 The units themselves are light and well ventilated with wood floors and open kitchens that maximize space. 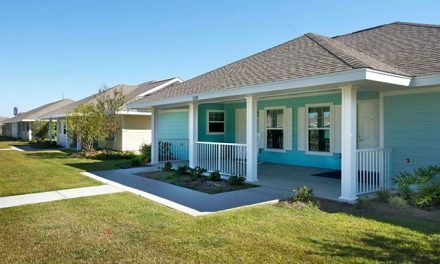 All units—including the live-in superintendent unit—are handicapped adaptable with 5% pre-adapted for accessibility. As one might expect, this project received significant publicity. It was seen by hundreds of thousands of people every day from the Brooklyn Queens Expressway. De Martino says, “This building was literally a billboard for ICF construction.” It also received coverage in the New York Times and several other media outlets, primarily because this building addresses one of the root problems in the region: the lack of affordable housing. 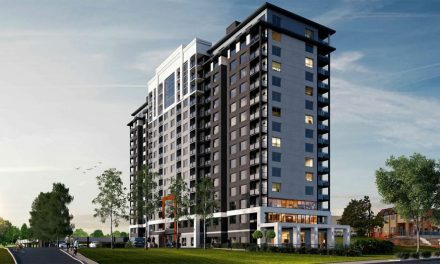 The problem is so severe that when Frost Street was finished in April of 2015, there were 80,000 applicants in the lottery to rent the units. 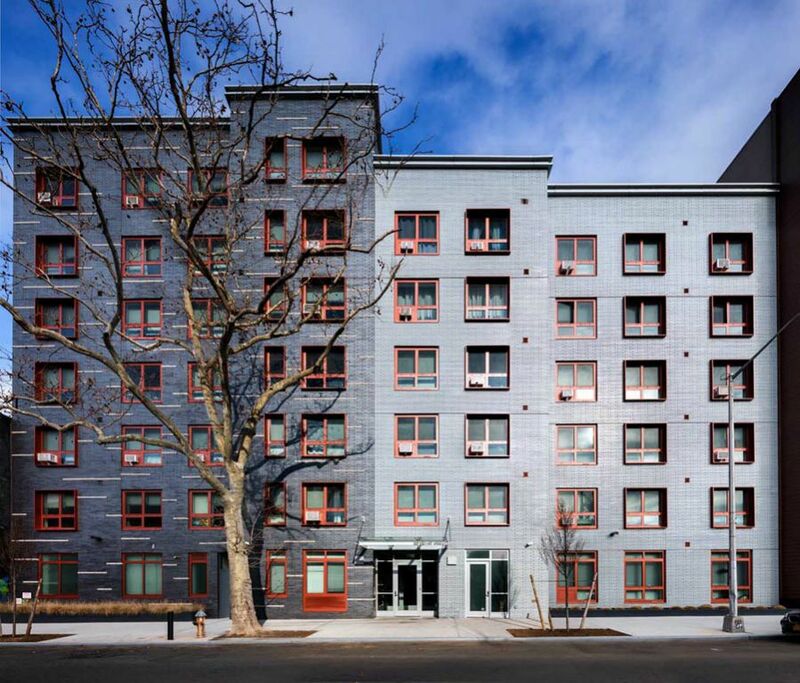 Mayor Bill de Blasio has pledged to produce 200,000 affordable apartments over the next 10 years, and this project shows one way to accomplish that. 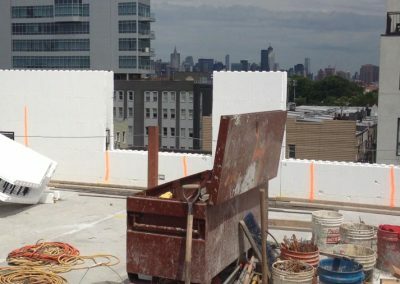 Brian Medford, a Fox Blocks regional manager involved with the project, says, “New York City’s energy code has become increasingly stricter every year, requiring tighter and higher-performing buildings for those that receive public funding. 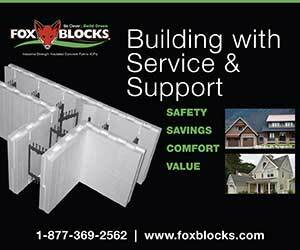 ICFs can meet these requirements in an affordable way. 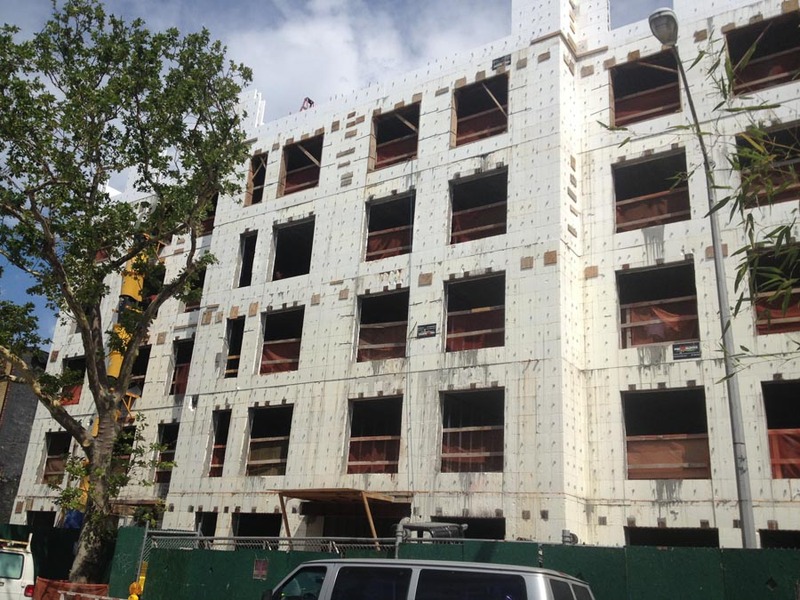 Together, with the obvious structural and safety benefits, these traits have enabled ICFs to leapfrog into the urban NYC landscape. 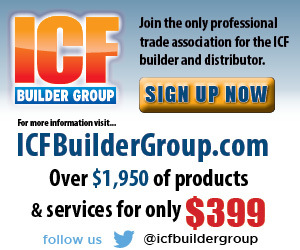 ICF Use: 103,000 sq. ft. 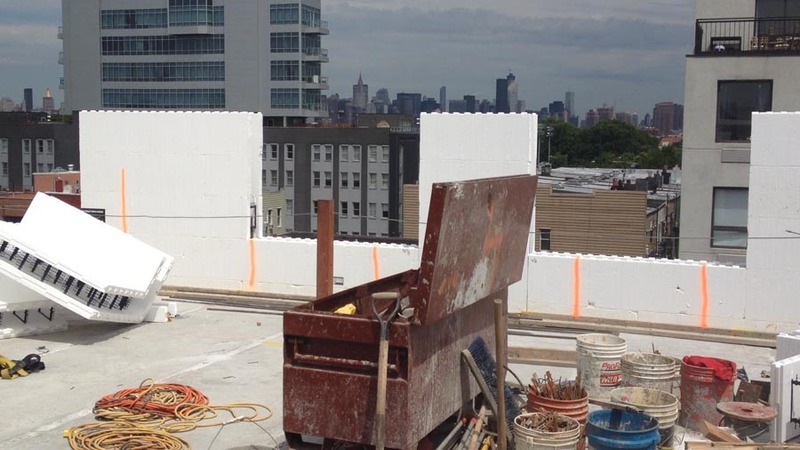 Built on a congested site in Brooklyn, road closures were needed to accommodate concrete pumps and precast floor installation. Suppliers ensured material arrived within an hour of schedule. 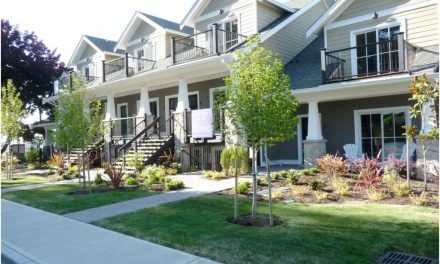 About 80,000 people applied to rent one of the 46 units.